From Brisbane we went to Sydney on the train to see Elly. It was about 12 hours on the train, you don't realise how big this country is untill you try to travel accross it. We stayed with Elly and her housemates for a couple of days, Sydney is really cool especially New Town where Elly lives its the area where all the students and artists live. We went down to the harbour and walked around all the typical tourist spots like the bridge and the opera house, it felt a bit strange to be here after looking at so many pictures and planning for so long. We also went to Coogee beach which was busy but we found a quiet spot under a tree and had a picnic. 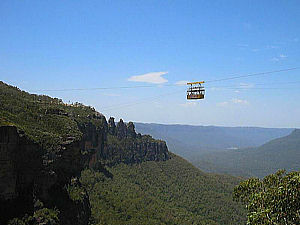 Its a nice place to go for a day out if you are in Sydney and its only about 30mins away. We had a really good time with Elly and her housemates were all really nice, we had a fun couple of days. We then took the one hour and a half train to woodford(which seemed like nothing after the extreemly long journey of the few days previous), Jo met us at the station. The blue mountains are a must see, the views are amazing and there really is a blue haze caused by tiny droplets of oil that the eucalyptus trees give off into the air. Jo took us to some of the lookouts in the area, the views go on forever just great expances of green and blue. We decided to hop on one of the tourist buses that has about 26 stops throughout the day and you just pay $15 for the day and jump on and off when you like. Its definately the easiest and cheapest way to see everything especially if you dont have a car.We visited Leura a small town with lots of craft shops,walked from the Gordon Falls to the cascades. I had really sore hands after the bush walk as i spent the whole time clapping to scare away the snakes, it did the trick, we saw only more of the great views that are everywhere you turn. We also went to scenic world where we went down into the valley on the scenic railway which is so fast and so steep you thing you are going to fall out. There is a short walk along the valley to the cable car that brings you back up with the best views of the three sisters which are pretty impressive. On Christmas day it was raining which made us feel right at home, we went up to Blackheath and had a very welcome roast dinner yum yum! We got to meet more of the family and everyone was really nice and we talked and ate and listened to music and swapped presents, it was a good day. Boxing day, the cocktail party with wes as head bartender with Elly, Jo and myself assisting, we made Tom Collings and a few other concocktions and the sun came out. We had a really nice tea and Jo makes the best tofu nut balls ever! We drank and ate and talked and listened to music, another great day. Everyone is so kind and willing to help you out without question. Jim and Carmel lent us their flat so that we could go and watch the fireworks down at the harbour on new year which we really enjoyed despite being pushed around by the other million people that were also there, we managed to get a goo view too. We bought a car from Jo's friend for $300 ,£150, bargin or what? We drove to Sydney for new year. If you are ever planning to drive up the east coast in Australia you should be aware of a few things, The roads are crap, they have huge craters in the road and the only warning about this is the odd 'Rough Surface' sign. Theres alot of road kill, best not to drive early morning or after tea to avoid the kangaroos, snakes and koalas trying to commit suicide. The Ozzies don't seem to see the speed limit signs and generally get annoyed when you stick to them.If it rains you will slow down put on your headlights and be more cautious this also seems to annoy people and don't even get me started on the 6 lane moterway or the 30secs you have to merge before your lane disserpears. But we survived and had a great new year and the car seemed to be functioning well. All in all a pretty great Christmas and new year.